Richard 'Nixxon' Sundblom is described by his Cobalt Motorsport web site as "The litle big man from Parainen, Finland with twenty years of racing experience". However, Richard will be making only his third appearance at Santa Pod in Pro Stock at the Main Event, with a 'Brander' new car. The team will be taking the long trip to England this week hoping for a good finish in the technical, some would say purist, class. Eurodragster.com caught up with Richard by E-Mail to fill in the gaps in our knowledge. Richard Sundblom: Well, fast American cars have always been close to my heart, so racing them was an easy step to take. Richard Sundblom: I started racing with my friends back in 1985 with my '67 Barracuda and I raced Street classes until 1991. For the 1993 season, I moved up to Competition Eliminator with a Dodge Daytona and finally to the Pro Stock class for the 1998 and 1999 seasons with a Dodge Avenger. Then I took a little break from drag racing, until in 2002 I come back with a Chevrolet Beretta, racing in the Competition Eliminator class in that year and 2003. And finally, I came back to Pro Stock for the 2005 season with a Chevrolet Cavalier. Eurodragster.com: What is your most successful season so far? Richard Sundblom: It has to be 2002, when I set a European record in my Competition Eliminator class and finished in runner up position in the NDRS Competition championship. Eurodragster.com: What influenced you to move up to Pro Stock? Richard Sundblom: After that '67 Barracuda, all my cars have been old Pro Stock cars with big motors, so the issue was not whether I can run them in Pro Stock, it was whether I will run them throughout the whole European tour. Eurodragster.com: You have a brand new Chevrolet Cobalt, once again built by Brander Race Cars. How did this come about? Richard Sundblom: To me, the Pro Stock class means continuous development work and that's what we try to do here in Finland. And, of course, having a race car builder in the team helps a lot! It is such a tight class, you have to do everything you can to go fast. Of course there was a lot of potential in Cavalier still to be found, but we think we will have to do this move at some point in the future anyway, so why not now? Richard Sundblom: We have updated the engine for unleaded fuel, because it is the mandatory fuel. That fuel caused motor damage last year, so it was something we had to do. We made some changes to the Liberty gearbox as well. Eurodragster.com: Is your 2005 car in new hands? Richard Sundblom: Yes, the Cavalier has been sold. Eurodragster.com: What are your racing goals for 2006? Richard Sundblom: A better position in the FIA rankings is the main target and getting that new car working on every track; then the 2007 season is going to be good. Eurodragster.com: What are your objectives for the Main Event? Richard Sundblom: We have a lot of work to do with that new car, so we really don’t know yet what to expect. Eurodragster.com: What is your business away from the track? Richard Sundblom: I am co-owner of the US car parts selling firm USA Power Shop in Turku. Eurodragster.com: How did you acquire the nickname 'Nixxon'? Richard Sundblom: Back in early '70s there was this Watergate thing going on, and I guess my friends thought I was a little bandit my self! So that name stuck with me. Eurodragster.com: Who is your hero in European Drag Racing and why? Richard Sundblom: Tomi Laine, he has made life job out of something he loves. Eurodragster.com: Who is on the team and what are their roles? Eurodragster.com: What is your route to the UK and how long does the journey take? Richard Sundblom: The car is coming by trailer via Sweden, Denmark, Germany and the Netherlands. The transporter is leaving Finland on Sunday and arrives at Santa Pod on Tuesday. The engine is coming from the USA and it should be at Santa Pod on Tuesday, too. Some of the team members are coming by plane on Tuesday and the rest on Thursday. Eurodragster.com: Who are your major sponsors? Richard Sundblom: USA Power shop, Fjader, Dinopoint, and Valvoline. At this point, I would like to thank my family and team members for their support; without them this would not been possible. 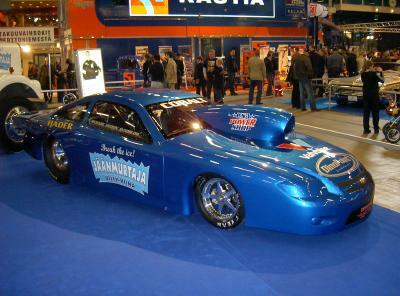 Eurodragster.com: Thank you for your time, Richard, and we look forward to seeing you in Pro Stock at the Main Event.